2010 ushered in a new branch of Elan Ministries: Garden on Marais. Shortly following Hurricane Katrina, the Spirit of Praise Assembly of God church donated to Elan Ministries a property in the St. Claude and Bywater neighborhoods containing a large warehouse building and a ¼ acre plot of land behind it. We began to pray and dream how we could use this gift to enhance and improve the quality of life in our community. Our dreams took the form of a garden. 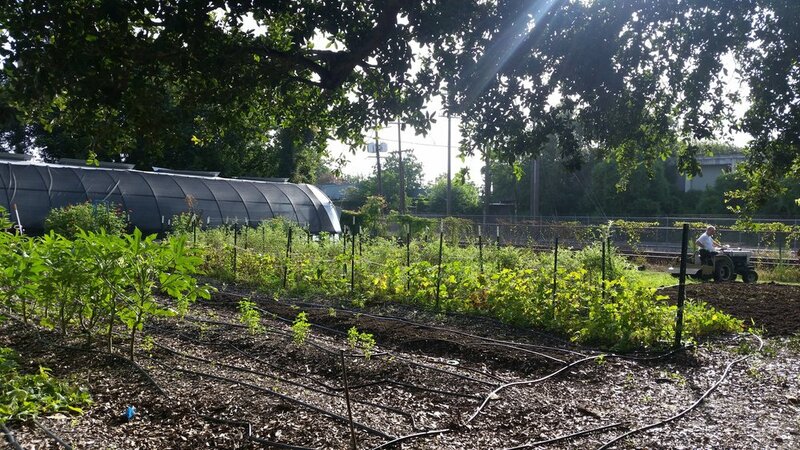 Today the property hosts a rain water catchment system, a hoop house for seed starting, a brood of hens, big and little humans, and lots of happy plants! In Spring of 2015 Garden on Marais launched its first 4-H Kids Club for youth ages 3 - 11. Through our 4-H Club we are engaging and educating the children and youth of the community in the scope of health, urban gardening, and stewardship. Are you a local, interested in volunteering with Elan Ministries? Please fill out this form, and we will contact you shortly to further discuss this opportunity. How did you hear about Elan Ministries? Thank you for your interest in volunteering with Elan Ministries. We will contact you soon to discuss further details. In the meantime, take look at Our Story and get to know the Elan Team!